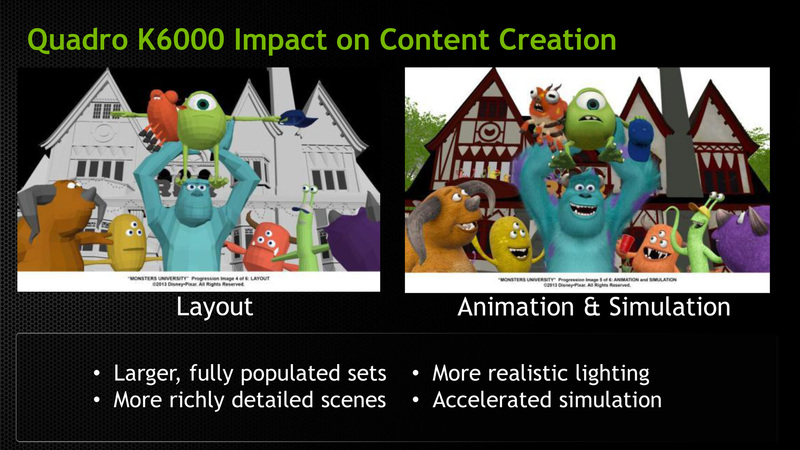 As SIGGRAPH 2013 continues to roll on, today’s major announcements include those from NVIDIA. SIGGRAPH is NVIDIA’s favored show for professional graphics and Quadro product announcements, with NVIDIA using last year’s SIGGRAPH to announce their first Kepler based Quadro part, the Quadro K5000. This year NVIDIA is back again with a new Quadro part, finally fully fleshing out the Quadro family with the most powerful of the Quadro cards, the Quadro K6000. 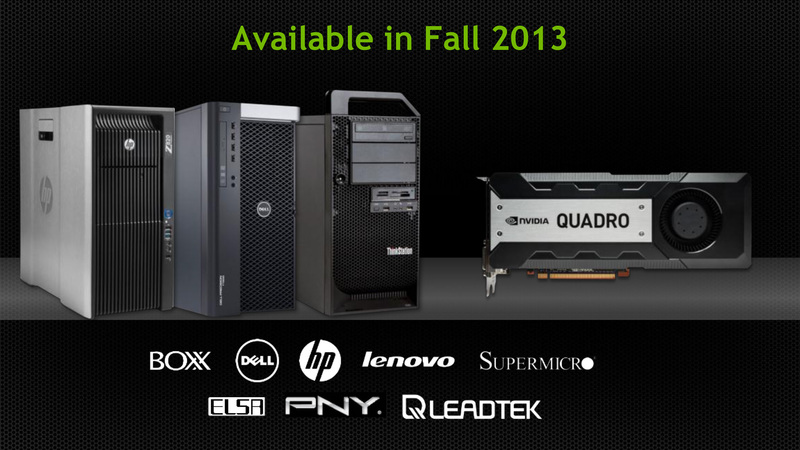 In NVIDIA’s product hierarchy, the Quadro 6000 cards hold the position of NVIDIA’s most powerful products. They’re not just the flagship cards for the Quadro family, but really the flagship for the entire generation of GPUs, possessing the compute functionality of Tesla combined with the graphics functionality of GeForce/Quadro, and powered by what’s typically the single most powerful GPU configuration NVIDIA offers. They’re unabashedly high end – and have a price tag to match – but in many ways they’re the capstone of a generation. It should come as no surprise then that with the Quadro K6000, NVIDIA is looking to launch what will become the king of the Keplers. When Quadro K5000 was launched at SIGGRAPH 2012, it was to be based on NVIDIA’s more graphics-oriented GK104 GPU. A GK110 Quadro was a forgone conclusion, but of course GK110 would not start shipping until the end of 2012, and NVIDIA had large Tesla orders to fill. So it has taken the better part of a year, but NVIDIA is finally shipping a GK110 based Quadro card and it is a doozy. With Quadro NVIDIA doesn’t promote the specifications of the card nearly as much as they promote the use cases – in fact they don’t even publish clockspeeds – but based on their performance data it’s always easy to quickly calculate the necessary information. With a quoted compute performance of 5.2TFLOPs/sec for single precision (FP32), Quadro K6000 is the first fully enabled GK110 part, shipping with all 15 SMXes up and running. These in turn are clocked at roughly 900MHz, the highest base clockspeed for any GK110 card. Paired with this GPU is a staggering 12GB of VRAM clocked at 6GHz, marking the first NVIDIA product shipping with 4Gb GDDR5. The TDP on all of this? Only 225W. Compared to the outgoing Quadro 6000, it’s interesting to note on just where NVIDIA’s performance ambitions have taken them. Besides the obvious doubling in memory, Quadro K6000 offers 1.7x the graphics performance but 5x the compute performance. The compute performance gains clearly outpace the graphics performance gains, reflecting where NVIDIA has gone with Kepler in their designs. The professional graphics market still highly values graphics performance and the Quadro K6000 should have no problem delivering on that, but for mixed use cases the compute gains will be even more remarkable. 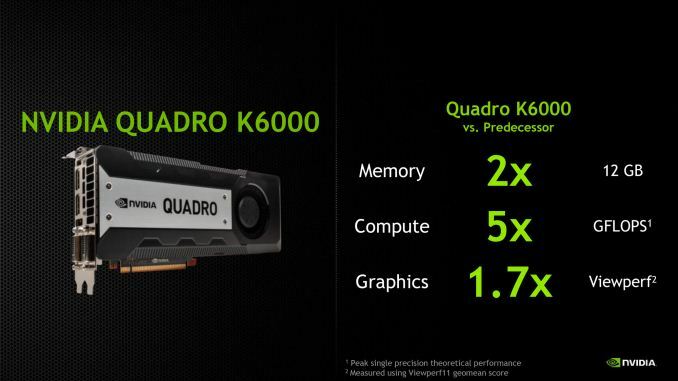 So who and what is NVIDIA pitching the Quadro K6000 at? As with the Quadro 6000 this is primarily (and unabashedly) being pitched at the deep pocketed content creation and product design crowds, who can afford to drop several kilobucks on a single card. In these cases the gains from Quadro K6000 are a mix of greater rendering performance and the greater VRAM. The latter in particular may very well be more important than the former, since often the limits in real time workloads is fitting all of the assets into memory rather than drawing them, due to the very severe performance cliff from spilling over into system memory. 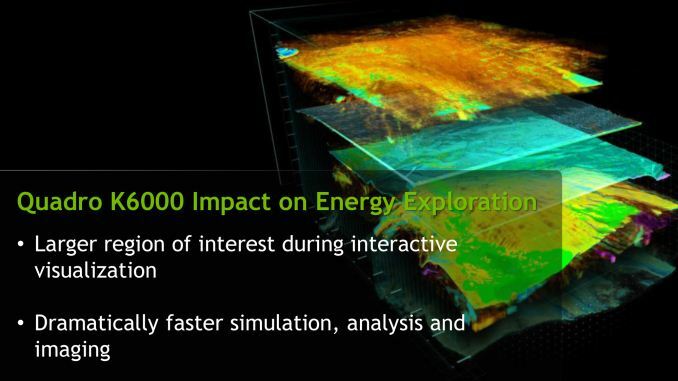 NVIDIA’s other big market for Quadro K6000, like Tesla K10 and K20, is the oil and gas industry, who use GPU products both to analyze seismic data and to display it. In this case the more that can be analyzed and the more that can be displayed at once, the more useful the resulting product is. 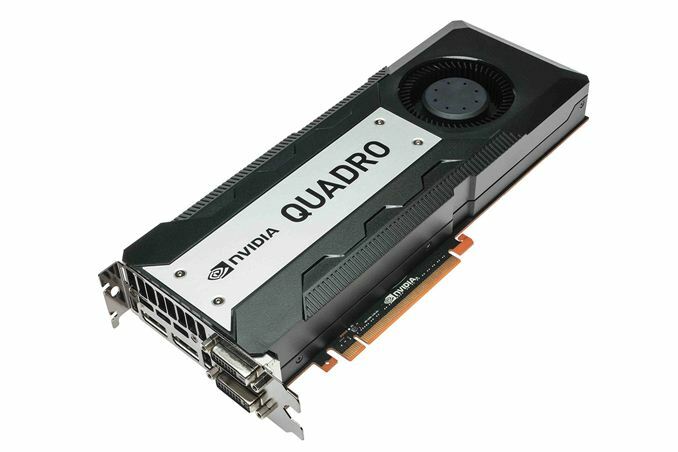 Moving on, as with Quadro K5000, Quadro K6000 is compatible with NVIDIA’s second generation Maximus technology, allowing for the K6000 to be dedicated to graphics work while compute work is offloaded to a Tesla card. The need for Maximus isn’t quite as great with K6000 as it was K5000 due to the K6000’s much greater compute performance, but offloading via Maximus still offers benefits in some mixed usage workloads by freeing up each device to work on a specialized workload as opposed to consistently context switching back and forth. Finally, let’s quickly talk about launch details. As is usually the case for Quadro products NVIDIA is announcing the Quadro K6000 a couple months ahead of its ship date, so K6000 is not officially slated to start shipping until sometime in the fall. As always the cards will be sold both individually and through NVIDIA’s usual OEM partners, including Dell, HP, and Lenovo. NVIDIA has yet to announce a price tag for individual K6000 cards, but based on the price of the previous Quadro 6000 cards we’d expect to see them at around $5000-$7000 each. Don't buy into the hype, the Quadro cards perform about on par with equivalent Geforces in games. The reason for any performance difference at all is that Nvidia purposely disables certain features on Geforce cards (often with drivers) so that they perform worse. They don't similarly disable features on the Quadros.